Strict controls would be "a necessity" to minimise the risk of spills and leaks from any future UK shale gas industry, according to new research. The research, by the ReFINE (Researching Fracking in Europe) consortium, jointly led by Durham and Newcastle universities, estimated the potential for spills from any future UK shale gas industry by examining data related to the UK's milk and fuel transportation industries and from the oil and gas industry in parts of the USA. 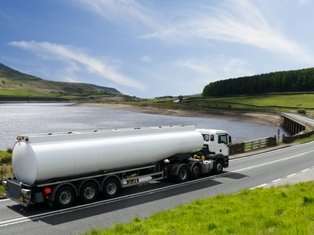 Scientists looked at the number of incidents - such as road traffic accidents - and spills involving tankers in the UK's fuel and milk industries as a comparator for any future UK shale gas industry. Hydraulic fracturing - or fracking - is carried out by injecting a mixture of water, sand and chemicals at high pressure into rock which then cracks to release the shale gas. Generally chemicals are stored on site before being mixed with the water and sand. The mixture that has been pumped into the ground is often taken away by tankers for treatment after use. Lead author Sarah Clancy, a PhD student in the Department of Earth Sciences, Durham University, UK, said: "There is currently no shale gas production within Europe, but exploration wells are underway and the public has expressed concerns about the effects on the environment including the potential for leaks to pollute land, surface water and groundwater. "Given the highlighted risks of spills from shale gas operations, mitigation methods are a necessity. "If a shale industry is to go forward in the UK, or across Europe, appropriate strategies need to be in place to minimise the risk of spills associated with well site activities and the transportation, handling, storage and disposal of hydraulic fracturing related fluids." Professor Richard Davies, Newcastle University, who leads the ReFINE project, said: "Our research on shale gas continues to follow up on the questions members of the public have raised about fracking. Our new research informs government, industry and the public on how likely spillage would be. "This is timely as fracking is now recommencing onshore in the UK after it was halted because of fracking-induced earthquakes in 2011." The research work was part of a larger project called M4ShaleGas (Measuring, Monitoring, Mitigating and Managing the environmental impact of shale gas), funded by the European Union's Horizon 2020 Research and Innovation programme.